At both Walt Disney World and the Disneyland Resort, guests are treated to castles, lovable characters, classic attractions, Mickey-shaped balloons, and…Dole Whips! 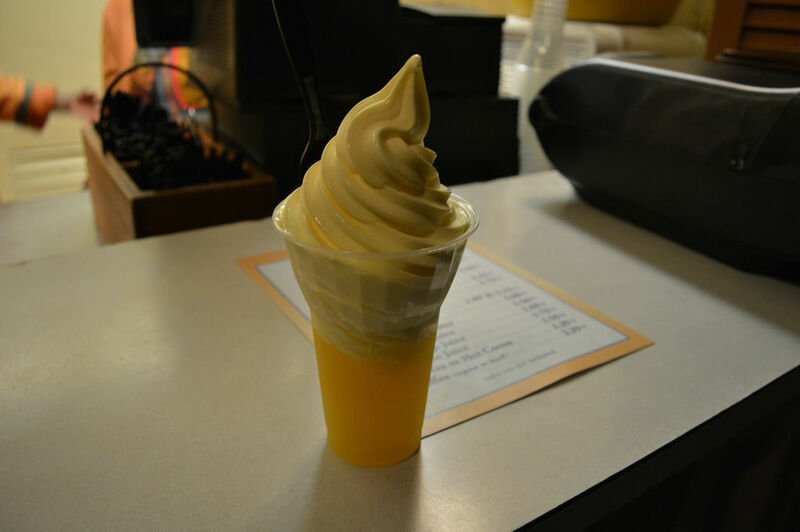 One of the most popular treats on either coast is a Dole Whip, which is pineapple flavored soft-serve that is seriously addicting and an essential part of the Disney Park experience. Some Dole Whip Enthusiasts, like myself, prefer Dole Whip Floats where the soft-serve is served up in a cup of fresh pineapple juice. Others, however, believe the soft-serve alone is the only way to enjoy a Dole Whip. Now Dole Whips have been popular in the parks for quite some time, but in recent years Dole Whips have become even more famous at both Disneyland and Walt Disney World — inspiring t-shirts and even home décor! Now that got me thinking; Which coast does Dole Whips the best? How is getting a Dole Whip at Disneyland different than at Walt Disney World? I plan to answer just that in Disneyland vs. Disney World: The Dole Whip Experience. Location: Once upon a time, the only two places to get a Dole Whip at Walt Disney World were Aloha Isle in the Magic Kingdom’s Adventureland and Captain Cook’s at the Polynesian Village Resort. That is now no longer the case: These days, Walt Disney World guests can get a Dole Whip at not just Aloha Isle, but also at the Pineapple Lanai at the Polynesian Village Resort, Tamu Tamu Refreshments at Disney’s Animal Kingdom Park, and at different booths during Epcot’s annual festivals, such as the Flower and Garden Festival each spring and the Food and Wine Festival each fall. At Disneyland, however, there is still only one place to experience a Dole Whip and that’s at the Tiki Juice Bar in Adventureland, right in front of the Enchanted Tiki Room and near the land’s entrance. Clearly, Disney World has the most locations — and the Pineapple Lanai at the Polynesian Village gives guests and locals the ability to satisfy their Dole Whip cravings without park admission. Variety: At the Disneyland Park, traditionalists will be glad to see that the Tiki Juice Bar still offers the simple, classic Dole Whip soft-serve and float that we all know and love; but if you’re looking for variety and new ways to enjoy a Dole Whip, then Walt Disney World is for you. At Tamu Tamu Refreshments at Disney’s Animal Kingdom Park, and during Epcot’s annual festivals, Dole Whips are often served with different flavors of rum. Also, Sunshine Tree Terrace at the Magic Kingdom’s Adventureland, which is home to the popular Orange Bird, serves up citrus swirls! This frosty treat is similar to a Dole Whip, but orange flavored. Price: Despite the fact that the Disneyland Park and Walt Disney World’s Magic Kingdom are on two different coasts, the prices for Dole Whips are mostly the same. 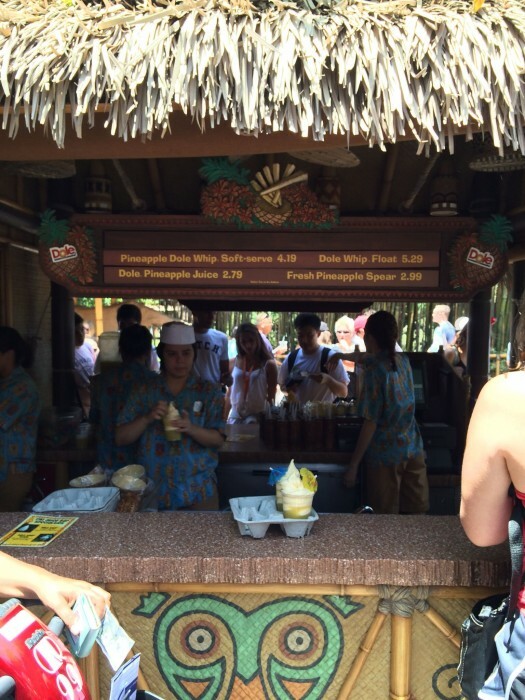 For example, Pineapple Dole Whip Soft-serve and Dole Whip Floats at both Disneyland’s Tiki Juice Bar and Disney World’s Aloha Isle are both $4.19 and $5.29 respectively. But there is a contrast in price when it comes to getting a Dole Whip in a souvenir Tiki Bowl. At Disneyland, the soft-serve in Tiki Bowl is currently $8.79 while at the Pineapple Lanai at the Polynesian Village Resort, it’s currently $9.19! Wait Time: This is a hard thing to gauge as lines can vary depending on the time of the day to the time of year or for no clear reason at all! Back when Disney World’s Aloha Isle was in its original location, the lines could be very long. I know I’ve waited for thirty minutes, if not longer, before even getting to place my order in times past. 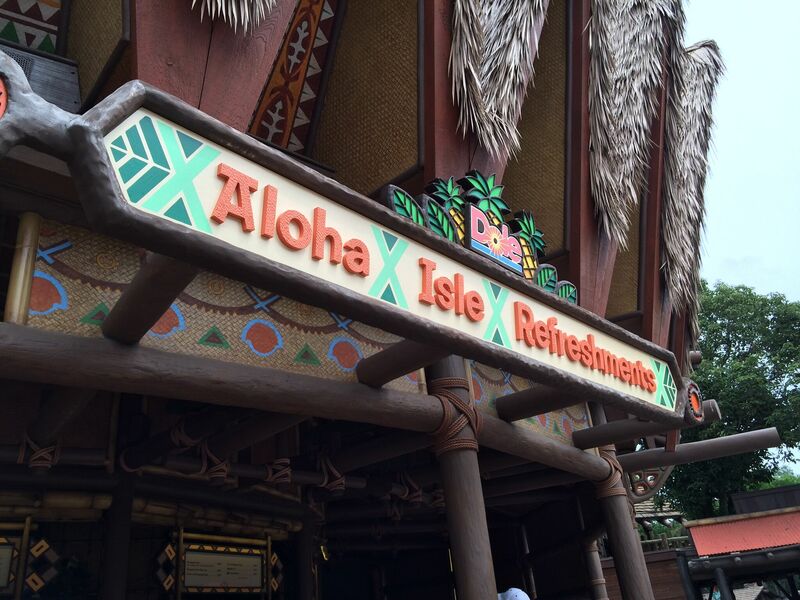 Fortunately, wait times have improved since Aloha Isle moved to its new location, the former home of Sunshine Tree Terrace, which has more registers and more space to accommodate the droves. You can find it in Adventureland, just behind the Magic Carpets of Aladdin. During my last visit, I only waited about ten minutes at the new location as opposed to half an hour. Also, as there are more locations at Disney World to get a Dole Whip, you can at times avoid lines completely. This is especially true of the Pineapple Lanai and Tamu Tamu Refreshments at Disney’s Animal Kingdom Park. Now at Disneyland, as there is only one place to get a Dole Whip, you can imagine that there’s a line most of the time. In fact, when I visited a little over a month ago, the line looked to be about forty-five minutes! However, there is a secret to getting a Dole Whip quicker! Make your way through the Enchanted Tiki Room entry and get in the line for the Tiki Juice Bar on that side of the stand. It’s much shorter and, as of now, Cast Members don’t mind if you get a Dole Whip and then exit instead of watching the Enchanted Tiki Room show. Presentation: At Disney World, Dole Whips and Dole Whip Floats are served up with that trademark twist but…that’s about it. Unless, of course, you order your soft-serve in a souvenir Tiki Bowl. Although, at Disneyland, a Dole Whip is presented with a mini tropical umbrella! Who doesn’t love those? Plus, you get a cherry too! Why Disney World doesn’t do this, I’ll never know, but Disneyland certainly knows how to make near perfection just a little more perfect. But I do have one minor complaint. When I ordered my last Dole Whip at Disneyland, the Cast Members at the Tiki Juice Bar were making Dole Whip Floats a few minutes in advance and then handing them to the guests paying to trim down the lines. As it was warm out, my Dole Whip Float was a little on the melted side when I received it. Still, I don’t think you can beat the umbrella and cherry in comparison to plain Dole Whip soft-serve. See how simple the menu is? It even has pictures! 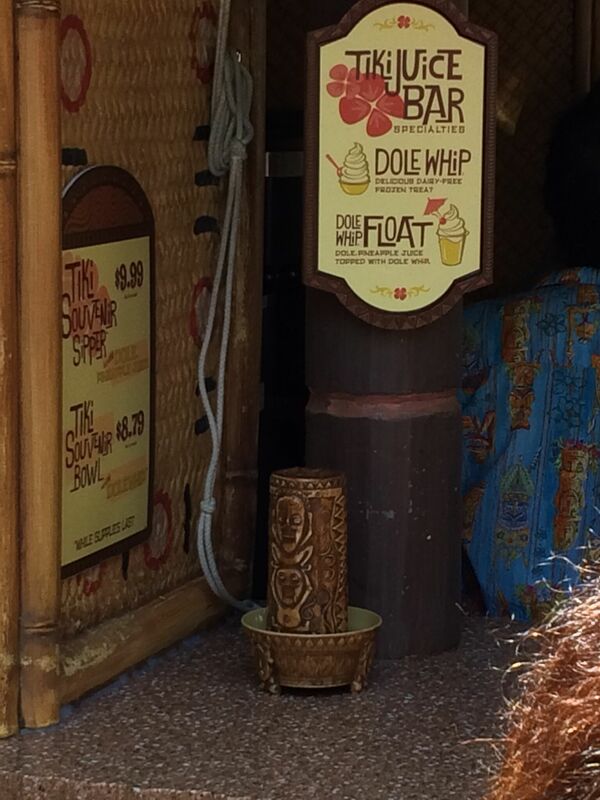 Menu: I may be alone in this, but has anyone ever found it difficult to order a Dole Whip or Dole Whip Float? At Disney World, the menus at the locations known to serve Dole Whips tend to confuse me. 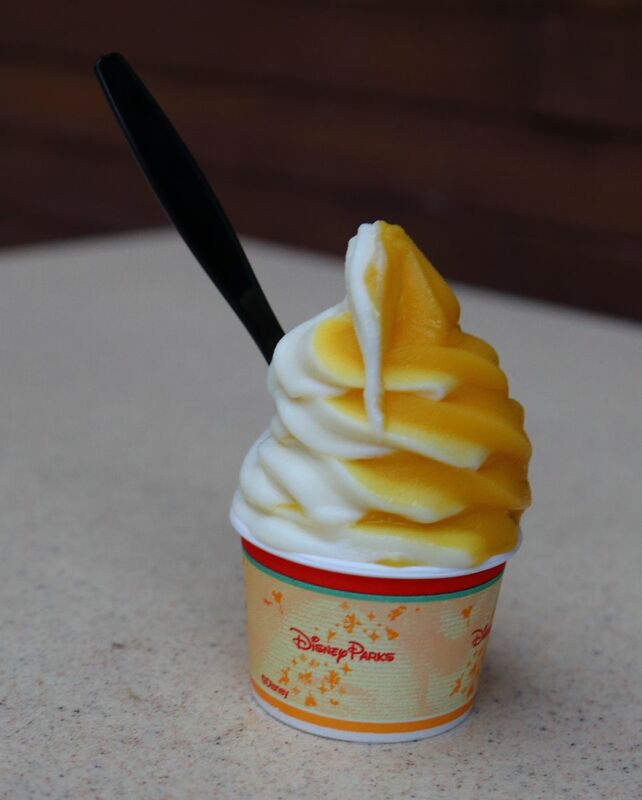 For example, at Aloha Isle, Dole Whips are listed as a Pineapple Dole Whip Cup or Pineapple Dole Whip Float; but at the Pineapple Lanai, the menu has Dole Whips listed as simply Dole Whip soft-serve or Dole Whip Float. Then, over at Tamu Tamu Refreshments, the Dole name is removed completely and the treat is referred to as just Pineapple Whip soft-serve! Part of this, I understand, is due to the variety of options different locations offer; but still, I have to order my Dole Whip differently at nearly every Dole Whip spot! Fortunately, Disneyland Park has kept things simpler. At the Tiki Juice Bar, the only items offered are Pineapple Dole Whip soft-serve or a Dole Whip Float and a Tiki Bowl. The lesson here? Keep it simple. So which coast boasts the best Dole Whip experience? It’s a tie according to the categories, but I must say that I think Disney World has the edge. While Disneyland has the best presentation, an easier menu, and cheaper prices, Disney World’s variety, shorter lines, and convenience of locations play a bigger role when it comes to my quest for a Dole Whip. But do you agree? 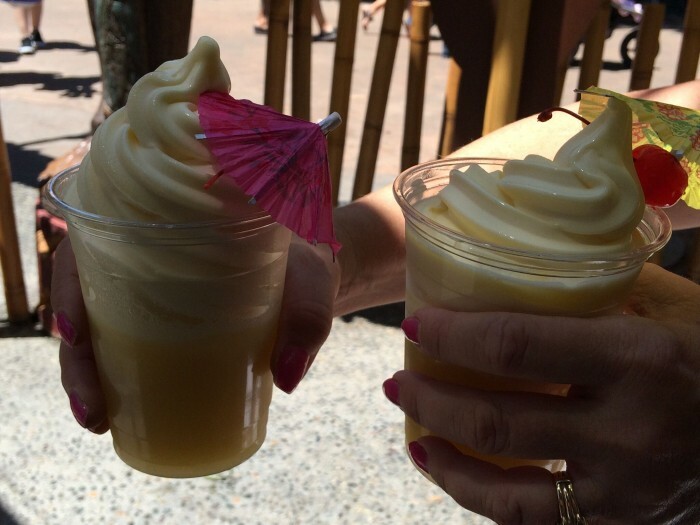 Which coast do you think offers the best Dole Whip experience? At Disneyland I got to eat a Dole Whip while watching the preshow to Walt Disney’s Enchanted Tiki Room. Winner. I also agree the menu at WDW is confusing, especially when it’s 90+ degrees out and having to decide between which one to get! For me, Disneyland wins for one key reason – you can enjoy the Dole Whip while watching the Tiki Room, especially nice on a hot day. You neglected to mention that the pineapple soft serve (aka Dole Whip)at Animal Kingdom and at Epcot’s festivals come “spiked,” a great adult option. And the Tiki Terrace at Trader Sam’s Grog Grotto at the Polynesian Village Resort also offers a apiked Dole Whip (from the Pineapple Lanai) called the Spikey Pineapple. More reasons why Disney World’s offerings top Disneyland. I don’t know why (or how), but they do taist different too. West Coast is my winner! My last Dole Whip at Disneyland was hollow in the center. It looked like a big dish but was 1/3 air. I hadn’t noticed that happening a few years ago at WDW. Is this something new? Chris, I haven’t encountered this personally but I have heard this from others. I hope it’s not something new because I want as much Dole Whip per serving as possible!